This virtual tour will just give you some of the highlights of the museum. Please click the name of each room for more information and photos. Remember to stop in for a visit with one of our outstanding tour guides who can provide you with fun and interesting facts each and every time you visit. The Tin Ceilings, were done by Wheeling Corrugating, and are original. 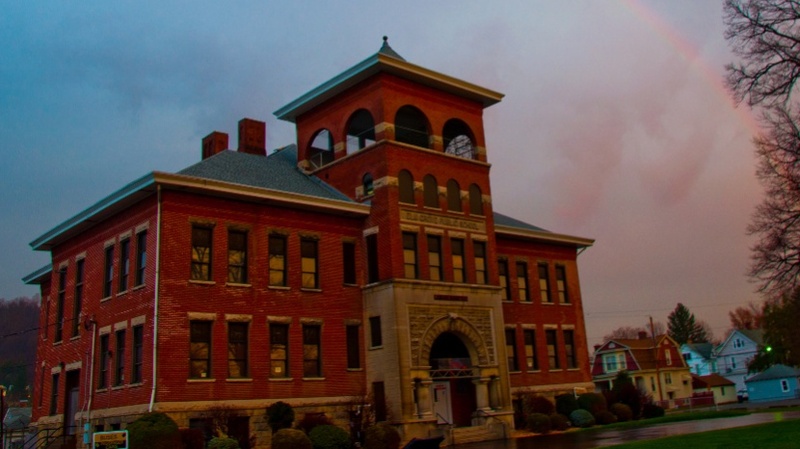 The building was built in 1905 and was in use as Elm Grove Grade School, and later Kruger Street Elementary School from 1906 until 1991. The wood work around the building is Red Pine. The Flooring is also the original that was redone and is Georgia Yellow Pine. We showcase a wide variety of the types of miniatures produced by Marx and other companies. The intricate details were often hand painted in the factories leading to each figure having a personal touch. From basic soldiers to detailed pontiffs; the range of products allowed for imaginative play and the pursuit of multiple collections. Throughout the cases you will find an assortment of miniatures that represents many different companies and their products. In this room you will find combat toys, actual combat materials such as uniforms. Also, in this room you will find many cars and trucks. This room is to show the many features of the Ohio Valley. It is our tribute to the city in which we are located and the many different unique attributes that can be found here. This room features trains by Marx, Lionel, American Flyer and others. This room is mainly miniatures but there are also real railway artifacts. These are changing displays– please check our calendar of events and learn about our current display!